﻿ Using Stones for Personal Growth. Jade: Decisiveness. Jade exists in two varieties: Jadeite (Sodium Aluminum Silicate) found in Burma and Guatemala; and Nephrite (Calcium Magnesium Iron Silicate) found in New Zealand, western Canada, Taiwan, Wyoming and Alaska. The most common type of jade in North America is Nephrite, which forms densely packed fibrous crystalline aggregates, usually green or grey-green in color. Wyoming jade is of the Nephrite variety. The name "jade" came from the old Spanish term "piedra de ijada" meaning "stone for the loins". The term derives from the Mayans' use of jade as a cure for kidney problems. Also, in both China and ancient Egypt, jade was used in burials in the form of a talisman placed next to the body. The vibrations emanating from the crystalline structure of Jade interact with your personal energy to strengthen Decisiveness. Decisiveness is the ability to make good and sound decisions without spending large amounts of time and energy vacillating between the alternatives. It is being definite, resolute and unambiguous in making decisions. If you are a decisive person, you know how to recognize a good decision from a bad one, and you are not afraid to act decisively in a concrete way. Decisiveness has both a doing side and a knowing side. The doing side is being able to make a decision whenever necessary. The knowing side is being able to distinguish a good decision from a bad one. These two aspects of decisiveness work together as two sides of the same duality. This means that as you develop the ability to recognize what makes up a good decision, you also increase the ability to make decisions in general. As soon as you know that a particular decision would be a good decision to make, then it is immediately a lot easier to actually make the decision. This is because recognizing a good decision when you see one, places you well along the way to making the decision. It gives you confidence to know a decision is a good one, and this makes it easier. The rest is just doing it. It takes considerable self-confidence to be decisive, to go ahead and weigh things logically and make a decision based on what you know. As a decisive person, you are not only good at making decisions, but you are also good at knowing when not to make a decision. You can be just as resolute in deciding to not make a decision about something, for example, if you don't have all the relevant information, or if you believe the timing is not right. Choosing to not decide on something for good reason is in itself making a decision. Sometimes, the fact that you have actually made a decision can be more important than which decision you have made. This is because making the decision is a form of completion. When the decision is made, you have done what you set out to do. And if it later turns out that the decision you made was not the best possible decision, you can feel justified in changing it without blaming yourself or agonizing about the outcome. Knowing that you have learned something about the outcome of your decision is often more important than which decision you made. If you have trouble making decisions, your life can easily begin to get away from you. You tend to agonize over decisions you know you need to make, and often end up frustrated and angry when you have to make a difficult decision. You don't trust your own judgement, and you have a great deal of doubt and uncertainty about the judgements you do make. Decision making often consists simply of making an educated guess, especially when the available information is partial or incomplete. In order to have confidence in your decision under these kinds of circumstances, you need to gather all the available facts, investigate them carefully, and then evaluate how sure you are about those facts being true. Assess how much you know for sure, and what you are only guessing at. This allows you to base your judgement on all the facts available to you. It is easier to make a decision if you have confidence in the information that the decision is based on. Another way to improve your decision making ability is to practice "putting out fires", that is, practice responding quickly to things that need your attention. Learn to take care of those things that are urgent and need to be dealt with right away. This will make you better able to prioritize how you use your energy, and will help you learn to make decisions rapidly, without spending a great deal of time worrying about how good a decision you have made. 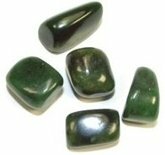 Carrying a small piece of jade in your pocket or purse will help you become more decisive. As your level of decisiveness increases, you will find that it is easier for you to know what situations require you to make decisions. And you will also find it easier to actually make the decision.